What a week! Less than one week ago, we cheered President Obama's bold action on the pro-peace resolution in the United Nations Security Council. And earlier this week, Secretary of State Kerry delivered a stunning, comprehensive and courageous speech on settlements, and laid out the Obama administration's vision of a two-state solution and the imperative to achieve it. Not only do both of these remarks and actions represent positions long-advocated by APN, but both events contain and/or reflect the significant research of Lara Friedman (APN Policy and Legislative Director), which documents how an Obama administration abstention would be in line with U.S. policy in the UN and which was published in the New York Times. Both events reflect as well Lara's testimony on settlements delivered on behalf of APN to the United Nations Security Council in October. APN worked relentlessly and effectively to make these important events happen. Help us keep the momentum going! I encourage you to read Lara's powerful and empowering thoughts (below) on what it means to continue to fight for peace after January 20, 2017. We can only continue our critical and singular work with your support. Before the year is out, please make a tax-deductible donation to support our fight for peace, security and dignity for Israelis and Palestinians. Those words were spoken yesterday by U.S. Secretary of State John Kerry, outlining the reasons that the U.S. chose to abstain on a U.N. Security Council vote condemning West Bank settlements. The threat to peace posed by settlements was recently made clear by settler leaders, who loudly and proudly proclaimed that “the era of a two-state solution is over.” And that was before President-elect Donald Trump nominated David Friedman, an enthusiastic supporter of settlements, to be the next U.S. ambassador to Israel. At APN, we’re preparing to take them on. Six years ago, APN launched a groundbreaking new feature: the “Facts on the Ground” map app. As both an iPhone app and website, Facts on the Ground has allowed anyone with an internet connection to learn about Israeli settlements in the West Bank – what and where they are, who and how many live in them, and how they relate to the Israeli-Palestinian conflict and prospects for peace. The app has been a success, with glowing coverage and reviews from NPR, CNN, Wired, The Guardian, Haaretz, The Jerusalem Post, and more. At this time of year, both Christians and Jews celebrate the triumph of light over darkness. This year, Christmas and Hanukkah overlap. We celebrate the light, count our blessings, and wish each other a happy new year. This time of year also features commitment and resolution. In Hebrew, the word hanukkah means dedication or rededication. They wrote: "Death to the Police"
Rejecting a government proposal to peacefully move to an adjacent plot, the settlers of Amona, who stole privately-owned Palestinian land to establish an illegal outpost, are vowing to fight. Amona’s forty families – reinforced by thousands of zealous settlers – are hunkering down for a confrontation with law enforcement officials, which could take place as early as tomorrow night. The settlers are being removed from Amona after Peace Now, together with the Palestinian land-owners, won a petition to Israel's High Court. The settlers promised that they will "only" passively resist the eviction, but past experience shows that their passive resistance quickly and easily turns into violence. Graffiti sprayed in Amona promising "Death to the Policemen” serves as an indication of the settlers' intentions. It's going to be ugly. It's going to be violent. It's going to be bloody. Not because Israel's police and the IDF want that, but because that's the way the settlers want it to be. It took me a couple of seconds to realize that this was neither a joke, nor the latest satirical "Borowitz Report.” The invitation to the Hanukkah celebration of the Conference of Presidents of Major American Jewish Organizations joyfully noted that the party will be co-sponsored by the Republic of Azerbaijan, will be celebrating religious freedom and diversity, and will be held at the Trump International Hotel. REALLY??? When I realized that it was neither a joke nor a hoax, I wrote a letter, together with my friends Jim Klutznick and Marty Bresler, the current Chair and the immediate past Chair of APN'S Board of Directors, explaining to the leaders of the Presidents’ Conference why they should count us out unless they change their choice of partner and venue. And, after sending the letter to the Conference’s Stephen Greenberg and Malcolm Hoenlein, we made it public. In our jointly authored book, my father, a writer, and I, a historian, took a fresh look at the mystery of Jewish survival. "Ours", we wrote, "is not a bloodline but a textline." Jews are not a people forged by blood and swords, but we are nevertheless an ancient nation. This belonging can cross international borders today; it tackles the religious-secular divide and the Israel-diaspora divide. Ours is a uniquely textual nation, whose sense of belonging comes from the Bible and a myriad of subsequent books, interpretations, arguments and questions. For many centuries, ours was the only pre-modern culture with universal male literacy, alongside significant female literacy. "Tell your child": this is our oldest and best survival technique and cultural instrument. But we do not only teach our children to read and remember. We also encourage them to think afresh, and to challenge their elders with questions and ideas. Also to laugh: at ourselves, at authorities, and even at the Almighty. As you know, all good Jewish families argue. Humor, irreverence, debate, originality, and text-based inventiveness: these are the ancient codes of Jewish survival. They explain our global sense of cousinhood - or at least a shared sense of humor - in today's world. It is the key to our three-millennia survival. Does 'textual nationhood' mean that the Land of Israel is unimportant? That Jews ought to have remained stateless? Not in my book. The State of Israel, which my four grandparents helped build in the fields of the kibbutz and in the libraries of Jerusalem, is a miracle even to secular Jews like us. It came into being when young Jews of the 20th century transformed longing into activism, memory into state-building, and Talmudic reasoning into modern invention. Today is Giving Tuesday, and I am writing to ask you to consider donating to Americans for Peace Now and to Israel’s Peace Now movement, two organizations that work together to advance the liberal values championed by the founders of both the U.S. and Israel. I just returned from Israel after an exciting week with APN’s annual Israel study tour. During my stay there, I had dozens of conversations with progressive Israeli friends. All of them – in one way or another, sometimes basking in schadenfreude – welcomed me to their club. These days you may be feeling shell-shocked, angry, and depressed. We certainly are: As we observe Washington’s new political landscape, we acknowledge that advancing an Israeli-Palestinian peace agenda, based on a two-state solution, will be difficult. We have long said that supporting Israel means supporting peace. This was never merely a slogan. Compromising core Jewish values in order to avoid criticizing Israel comes at a high price – both for Israel and for Jews in America. Jewish values are incompatible with occupation. We will not give up – and you must not give up, either. Israeli superstar and peace activist David Broza has never given up. He has performed in anti-war demonstrations despite warnings that political activity would destroy his career. He has fought with all the tools he had - his music, his songs, his voice. And he is still fighting. His album, East Jerusalem, West Jerusalem, is a collaborative project with Palestinian musicians focusing on hope and peace. Active in Peace Now for decades, he is proud to partner with Americans for Peace Now, to offer you the album and the film — a CD and DVD set — for a donation of $36 or more. All but $15 of your donation is tax-deductible. This #BlackFriday, the Friday after Thanksgiving, support our work in this critical moment - and get a little hope for a friend (or yourself). Hope is not just something you have, it’s something you make. The election of Donald Trump to the presidency of the United States has set off reverberations around the world. For many, the alarm bells could not be ringing any louder. A campaign that featured anti-Muslim and anti-immigrant sentiment, and was supported by a legion of online anti-Semites, is now transitioning to an administration that makes many Americans justifiably fearful. Steve Bannon, the former editor of the right-wing Breitbart News who has trafficked in conspiracy theories, race-baiting, and anti-Semitism, has been appointed as President-elect Trump’s chief strategist and counselor. Lt. Gen. Michael Flynn, an avowed Islamophobe, has been appointed as national security advisor. Senator Jeff Sessions, an anti-immigrant crusader who has made numerous racially insensitive and derogatory remarks, will become Trump’s attorney general. And Trump is considering the appointment of secretaries of defense and state who would seek to destroy the Iran deal, jeopardizing U.S. and Israeli security in the process. Help our ad campaign go national! Help us keep Rabin's vision alive. 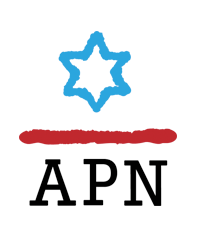 During the past several months, we at APN placed a series of ads quoting senior security officials in two east coast Jewish newspapers – with great success. We now want to make it into a national ad campaign and place ads in Jewish newspapers across the country. With a $25 contribution from you, we can go national with ads like this. The three bullets that ended the life of Israeli Prime Minister Yitzhak Rabin 21 years ago were intended to kill the prospects for Israeli-Palestinian peace. Yigal Amir, the Jewish terrorist who assassinated Rabin, did succeed in setting back Israeli-Palestinian negotiations, but must not be rewarded with his ultimate goal: the death of Rabin’s vision of an Israel that is both Jewish and a democracy, living in peace with its neighbors.You can’t help but wonder what Israel’s relations with the Palestinians, and indeed the world, would have looked like today if Rabin had been able to fulfill his vision. It is incumbent upon us to not only wonder and imagine, but to act to make Rabin’s vision a reality. Help us keep Rabin’s vision alive, help us keep the hope for peace alive. Your contribution will help us show our fellow American Jews that Israel’s top security community rejects the belligerent, hardline policies of Benjamin Netanyahu and his government. Help us show that capable, responsible security chiefs walk in Rabin’s path, fighting for peace.